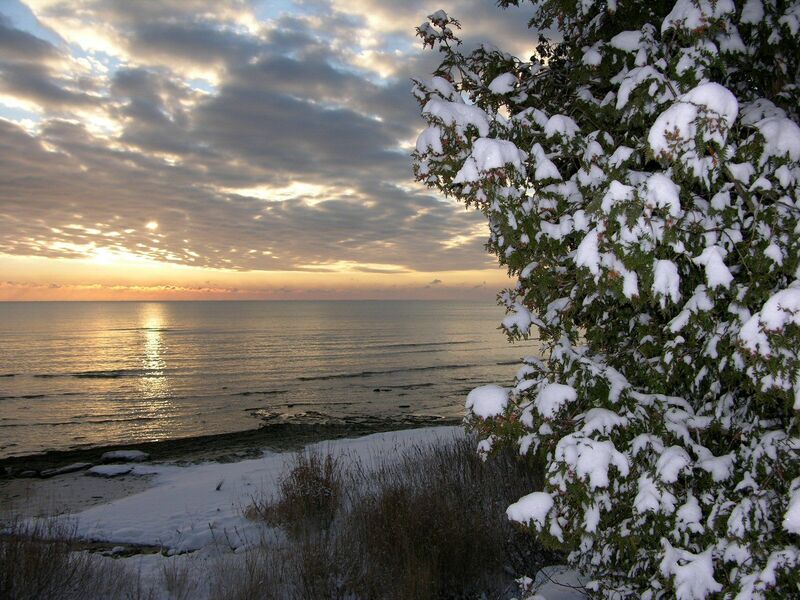 From ice fishing to snowmobiling, snowshoeing to cozy inns and fish boils, there is lots to enjoy in Door County after all the summer beach bums go home. 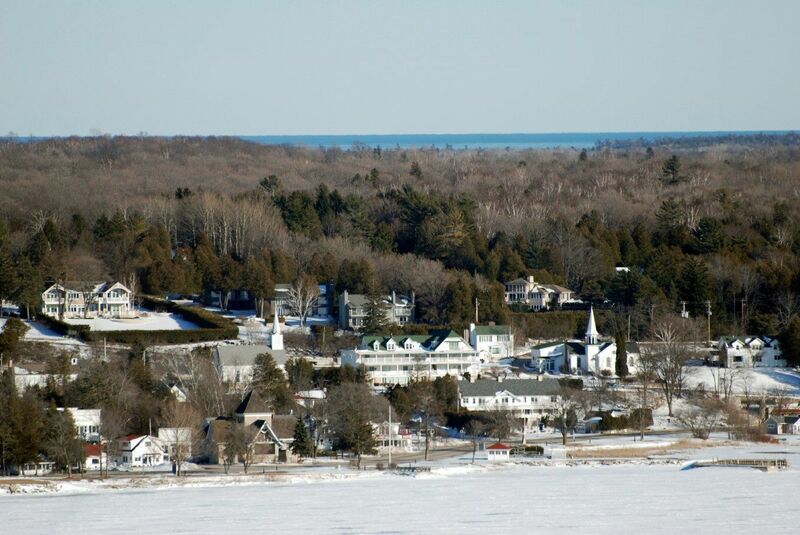 Door County is best known as the summer stomping ground for Midwesterners and Chicagoans who come to enjoy its miles of beaches, historic lighthouses, arts and culture, boating and fishing and edible regional specialties such as cherry pie and white fish boils. 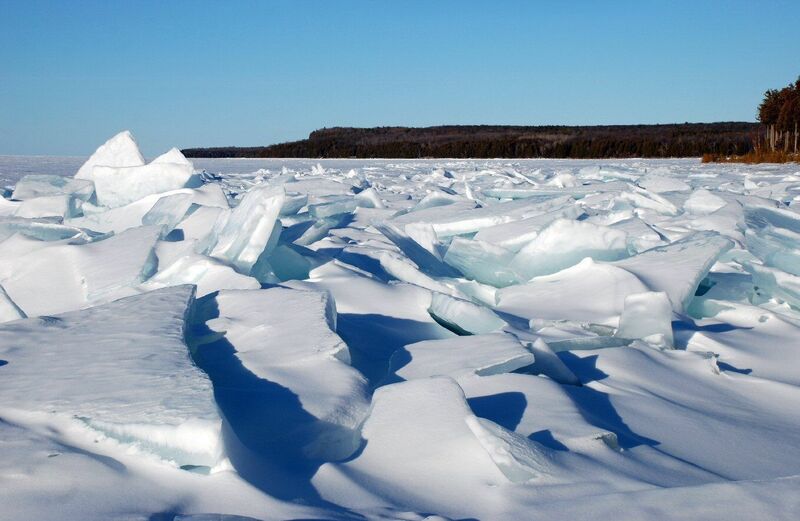 But the fun continues into the colder months, when Mother Nature transforms this finger-like peninsula that separates Green Bay from Lake Michigan into an icy winter playground full of cool activities for families. Many of the winter activities – snowshoeing, cross-country skiing, sledding, tubing, sleigh rides, snowmobile rides and ice skating – take place on land. But one — ice fishing — takes place exclusively on frozen Lake Michigan and it’s a great way to chill out for a half day. 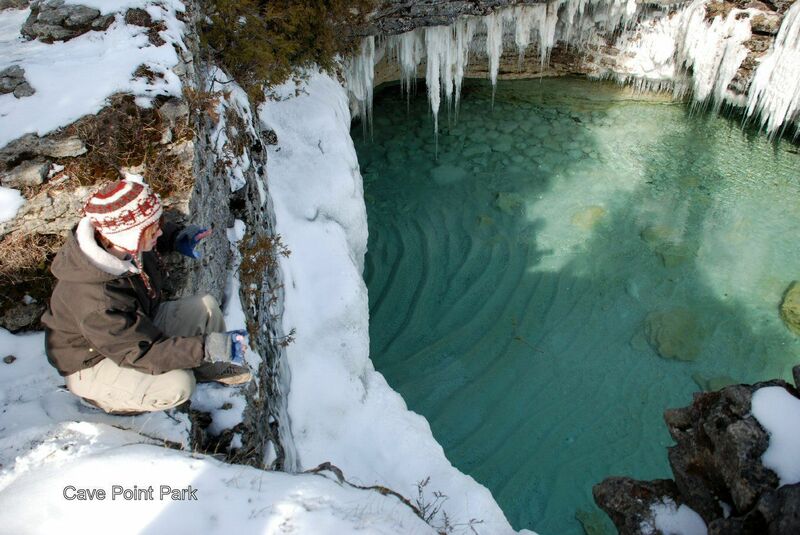 Another don’t-miss winter activity is an evening candlelight snowshoe, ski or hike at one of Door County’s state parks. They take place throughout the winter and it’s worth planning your trip to include one. Indoor activities are plentiful, too, and Door County has an unusual art studio that can keep you busy for a full day, as well as an old-fashioned bowling alley, nature centers, movie theaters and more. But most guests will want to sample as much of the outdoor fun as possible, no matter what the weather. Best for fishing-crazed families with older kids; this once-in-a-lifetime experience takes you across frozen Green Bay before daylight in big-tire Polaris vehicles to a secret spot on the ice where the big fish are known to bite. Sit down on a bucket, pop your line in the water and dangle it ‘til you get a nibble from one of Green Bay’s famous nocturnal walleyes. Once the sun is bright and the walleyes go to bed, fish for whitefish — if you catch one you can bring it home and cook it. Whitefish is the fish that inhabits the cooking pot at Door County’s popular fish boils. Then when you’re ready to head home, speed along the frozen bay enjoying views of the shanty villages filled with ice fishing shacks on sled runners and the hearty souls who inhabit them for a day of fishing. Professional fisherman Dale Stroschein and his crew drive the vehicles, pick the spot and drill the holes with their portable ice auger – a meaty device that looks like a giant chain saw with a huge corkscrew on the end. Then Dale’s crew can be found through Wacky Walleye (920/743-5731). You can rent all sizes of snowshoes and explore the county’s various state parks – between them all there are more than 50 miles of beautiful forested trails for snowshoeing. The Ridges Sanctuary near Baileys Harbor offers guided snowshoe hikes on Friday afternoons in January and February. 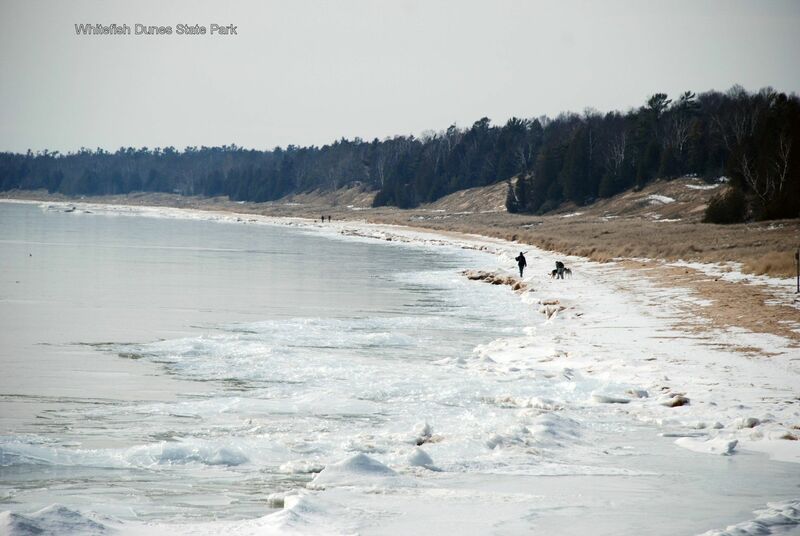 Groomed cross-country ski trails through the trees and even along the beach can be found at four of Door County’s state parks — Peninsula, Potawatomi, Newport and Whitefish Dunes. Crossroads at Big Creek, a nature preserve near Sturgeon Bay, also offers great cross-country skiing. Rent skis and snowshoes in all sizes, including children’s, from Nor Door Sport and Cyclery (920/868-2275), just steps from Peninsula State Park. Alternatively, cruise around on 250 miles of public and privately maintained snowmobile trails including 17 miles of trails in Peninsula State Park and eight miles of trails in Potawatomi State Park. For snowmobile rental, contact Zettel Sales, Rental and Service (920/839-2933) in Bailey’s Harbor. Ski or snowshoe along pathways lit only by the glow of candlelight during one of Door County’s candlelight ski events. The paths are relatively flat and easy and meander through the snow-covered meadows and the snow-dusted forest. Three state parks have evening candlelight hikes in winter, and it’s worth it to check into the dates so your visit will coincide with one of them. 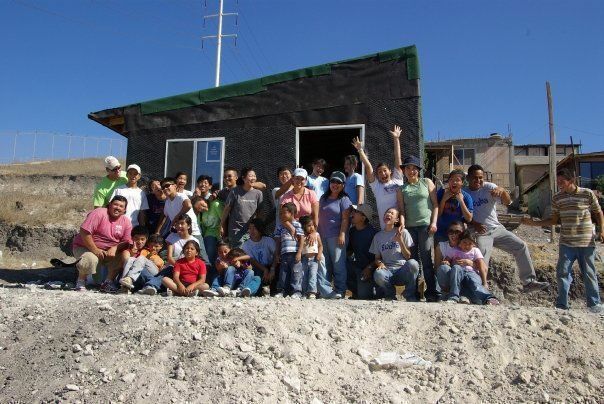 The excursions begin at a shelter where you’ll find refreshments, a bonfire and even lit grills for barbecuing. Check the calendar at wwwdoorcounty.com for dates and rent snowshoes or skis at Nor Door Sports and Cyclery (above) if you don’t have your own. The number 17 fairway at the local golf course, called Hole 17 Sledding Hill, is the locals’ favorite place to sled. Rent tubes or sleds at Nor Door Sport and Cyclery (920-868-2275; www.nordoorsports.com) or Nelson’s Shopping Center, (920-854-5752) across from Peninsula State Park. The prettiest and best located ice rink is in Sister Bay at the Teresa K. Hilander Rink. If you bring your own ice skates the skating is free, but you can also rent skates there and enjoy the concession stands. It’s an outdoor rink that also hosts hockey and broomball leagues. Call to find out ice conditions. 920-854-7014. 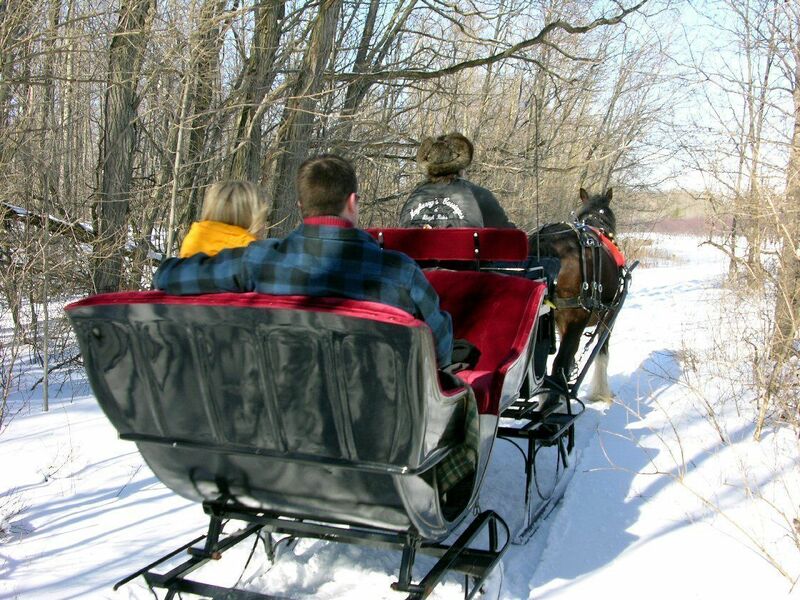 Cruise around on 250 miles of public and privately maintained snowmobile trails including 17 miles of trails in Peninsula State Park and eight miles of trails in Potawatomi State Park. For snowmobile rental, contact Zettel Sales, Rental and Service in Bailey’s Harbor (920-839-2933). Even if the weather is perfect, don’t miss a chance to spend a couple of hours at Hands On Art Studio in Fish Creek, a do-it-yourself art studio with far more than the typical paint-a-ceramic dish set of choices. You can learn to weld, meld glass, create a mosaic mirror, try spin art or jewelry making, or… simply paint a ceramic dish. It’s one of the most elaborate drop-in art studios you’re likely to find anywhere in the country. Open weekends in winter. 920-868-9311; www.handsonartstudio.com. Sister Bay Bowl is a vintage bowling alley with just six lanes where you can see the balls coming back to you in an old wooden track. It’s a fun place to spend a stormy afternoon. You grab your own shoes off of a wall of shoe shelves, pick a ball and play. When it’s time to pay you’re on the honor system — walk up to the bar and tell them how many games you played before you pony up. 920-584-2841; www.sisterbaybowl.com. Headquarter in or near Ephraim for easy access to the most activities in winter. The Waterbury Inn Condominium Resort (800/720-1524) has a great central location and features condos with one, two and three bedrooms. There’s a ping pong room, an indoor pool and if it’s not covered in snow, a small play structure for little kids. Another family-friendly property is the Landmark Resort (800/273-7877 or 920/868-7877) in nearby Egg Harbor. The Landmark has suites with multiple bedrooms and kitchens and an indoor pool and game room. 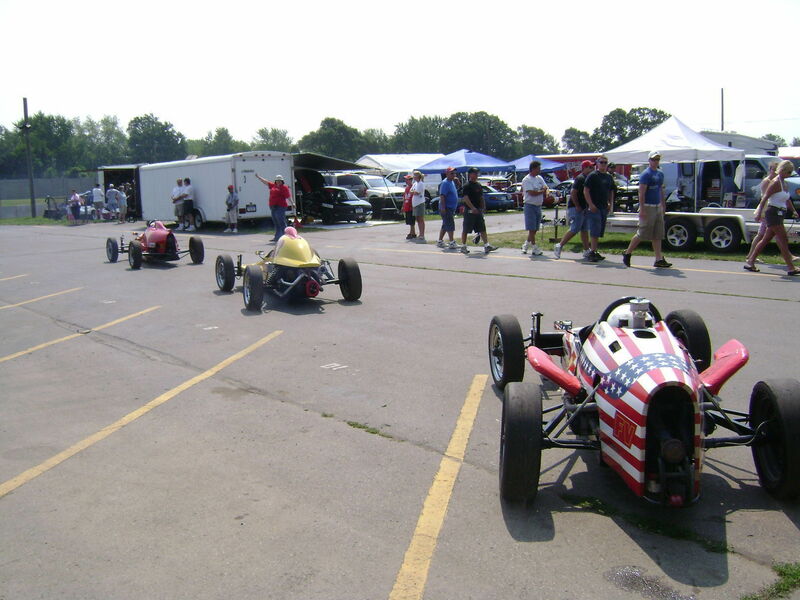 For more information on accommodations and other fun activities, visit the site of the Door County Wisconsin Visitors Bureau.